Well very nearly. By time most of you read this it will be. 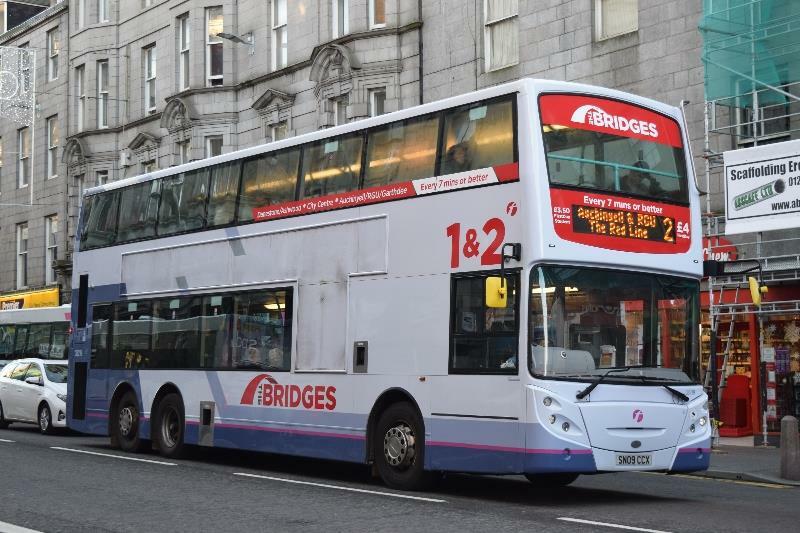 Having been ordered home for a couple of days to take a break from hospital vigils the timing turned out to be impeccible as Borderbus tweeted this morning that their latest E200, BB11 BUS, fleet number 108, was going to enter service tomorrow. So I took the opportunity to pop over to Beccles for a quick shufty at the newbie. Now those of you who didn't hit the booze too hard over the last few days will recall that I made a teaser post about BB11 a couple of weeks ago. Originally YX11 CSV (thanks Zak) the vehicle was acquired from Whitelaws of Lanakshire. When I first saw her the interior looked rather spartan as the seats had been sent off to be recovered and to have extra padding put in. In fact it looked like this. However today it looked rather different. Trouble is I only had my phone on me so sorry about the quality of the pics. Only 9 months to go and I can change the phone! I mentioned the extra seat padding. I'm happy to report that those seats are deceptively very comfortable, and I think I know why. Andrew Pursey told me that a firm in Southend was used to refurbish the seats, but not a company that usually does bus seats. This company normally does theatre and cinema seats, and my word it shows that they are used to catering for backsides which have to sit still in one place for a couple of hours at a time. I'm not a huge fan of anything non fabric but if an old cynic like me can sit in one and be pleasantly surprised the passengers should love them. There are still a few details that need to be attended to so she won't be out everyday just yet but how many companies have you seen painting the bottom interior of the doors black prior to entering service? Dave Marshall told me they are already working on eliminating the rattles and know what needs to be done. If only all operators took such a pride in the presentation and ride quality of their vehicles. The readiness of 108 means that the loanee little E200 MX12 DYO is returning to it's owners as soon as possible. It hasn't proved the most reliable of buses, and when I travelled on it last week it reminded me why I dislike the huge majority of E200's so much! The vinyls have already been removed. So finally I guess we need to see BB11 in all her shiny glory, and for that I'm unashamedly going to use the pic BorderBus tweeted this morning, as it's far better quality than my one! 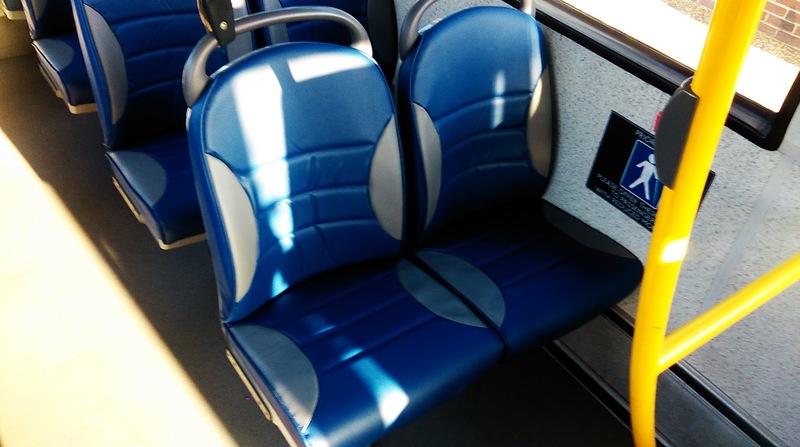 If you get a chance grab a ride on 108 and I'm sure you'll agree with me about those seats! I'll be back down Kent for the forseeable future so local posts may be few and far between. However I'm hoping to catch up on the ex Norfolk Green Agoralines and the 2015 STEVE Awards will be revealed over the coming days. Many thanks to everyone who have given me their good wishes - they have been a source of real strength to me. Happy New Year all. Although it goes without saying I wish I was down in Kent for other reasons I did take an hour's time out this morning to take a look at the new Rochester Station, which has only been open a couple of weeks. For those of you who have never been to the old one - opened in 1892 - I can inform you that it was THE coldest station in the UK, exposed to biting easterlies blowing in off the Thames Estuary. The entrance was depressing and the passageway and staircases downright Victorian, well they were I suppose. So it was with a sense of anticipation I parked up in the old market place where I used to watch the trains go by as a boy, and saw the rather imposing new glass building that has been built around 500 yards from the old station. First impressions were not favourable when I walked inside. It seemed darker, greyer and more depressing than the old one, and the words "Jubilee Line Extension" coarsed through my mind. However, it turned out that half of Rochester had been knocked out by a power cut, and the station was surviving on emergency lighting, no departure screens, ticket barriers or anything else electric apsrt from the lifts to and from the platforms. So maybe it's not as dark and dank as it looked today - I will return and find out! So I ventured onto Platform 1 to see if waiting facilities were anymore pleasant than the old station. In short yes and no. There is no waiting room which is a shame, but the shelters are far sturdier and weatherproof than the usual fare these days. How vandal proof they are remains to be seen. The new station is situated around 500 yards up from the old station. Standing at the far end of Platform 1 you can just see the end of the platforms of the old station. The first train I saw at the new station wasn't actually a type you ever see in service there. Class 376 Electrostars operate the suburban services between Gravesend/Dartford/Sevenoaks and Hayes into London, but are occasionally stored and maintained at Gillingham, just down the line a few miles. One was passing through ECS as I arrived on the platform. The old Station had 4 platforms but could only accommodate a maximum of 10 coach trains. At present the new station only has 2 platforms, which can easily take a 12 coach train, but there is also a third platform, which as you can see isn't open yet. Eventually Platofrm 3 will be a through platform, but when it opens it will initially be a bay platform. The reason for that is rather important. Rochester signal box is in the way, and until the signalling is upgraded still controls things in the area. In a couple of years it will be demolished and the line through platform 3 will be completed. There is a lot of development planned for the area between the station and the River Medway. It is hoped the new station will encourage more business to the area, and will be a major selling point for new residential developments. The new location is also closer to the historic part of Rochester, which is also seen a potential lure for tourists to the city. 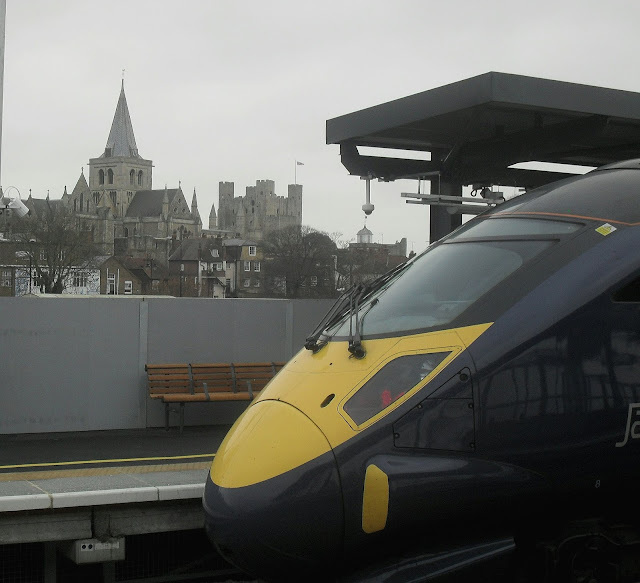 Of course another plus point for Rochester is it's part of the HS1 network, and that means not only is it a mere 35 mins from St Pancras, but on a dark, grey, Sunday morning it also means Javelins. And Javelins are good to take photos of. I have just a couple of criticisms of the new station. Firtly there are not that many station signs on the platforms. Secondly, especially on the Up platform the shelters are too far down the platform for short trains, and anyone sheltering from the elements will face a sprint back up the platform for a 4 coach train. Finally I have mentioned that the power cut resulted in the destination screens being blank. Nowhere on the station are there timetable posters and I find that strange and wrong, not to mention darned inconvenient. Something Southeastern should look into I feel. But other than that the new station is a big improvement on the old one, as long as it is properly maintained and protected. I have spent many happy hours in my life in Rochester Cathedral, and in and around the Castle. I also happen to rather like the Javelins, and those who are complaining about Siemens winning contracts for GWR clearly haven't been on a Javelin. I can't wait to see the superior spec. However always on the look out for a decent pic I'll settle for this one, showing the Javelin against the historic backdrop of Rochester. I hope the new station is a success. Rochester Cathedral, Castle and a Javelin! First of all this is not a transport related post, but I can't keep this to myself. I would ask you to read this, and next time you hear one of the seemingly endless negative stories about our NHS I'd ask you to remember this one too. If ever there was a heart warming Christmas story this is it. Some of you already know that my father is making final preparations to set sail to a better world. After a recent heart attack his kidneys have packed up and we are just all waiting for the inevitible. So Christmas Day was spent at the William Harvey Hospital in Ashford, down in Kent, watching the man who has graced all our lives for so long get weaker and weaker. It could be hours, it could be days but it's going to happen. For the last month his care has been incredible. Over the last 8 years he's been in a lot of hospitals thanks to two bouts of cancer and stroke, and the care he's received has been nothing but amazing. However this hospital is something else. Last night dad was finally moved from a bay ward to a private room to give him as much peace as possible for his remaining time. This morning just before we left to drive to the William Harvey I got a call from the hospital. It was Paul, one of the staff nurses on dad's ward explaining that dad's room was required by an emergency infectious patient, and as a result dad was going to be moved to another room, but on another ward where a different team would be caring for him. The guy sounded really cut up and dad had mentioned frequently what a good relationship he had struck up with the staff. Paul insisted that we saw him when we arrived and he would show us to the new room. We had been there no more than a couple of hours in the new room - the new team were just as friendly and efficient as the others - when Paul came back saying the other patient hadn't been as bad as anticipated and they were able to offer dad his original room back. He was worried about the effectt of yet another move on dad, who was asleep at this point, but he said he and the other nurses on his ward had grown so fond of and attached to dad they were so upset when he had to move and "we would really like to see the job through". Of course we were over the moon. When he woke up so was dad. When he was wheeled in his bed back onto the ward it was like a celebrity homecoming. All the nurses welcomed him back by name, beaming from ear to ear. These amazing, truly wonderful people want to make dad's remaining time as comfortable and stress free as possible. I don't know how many people come and go from that ward in a week but it's a fair few. Yet the personal care and yes love these people show is so, so much more than merely doing a job. They say Christmas is about peace, love and joy. This is a tragic and extremely tough time at the moment, but I saw more love producing peace in that hospital than I've seen anywhere before. And that, despite the desperately sad circumstances has given us joy in the knowledge that there is nowhere that dad could be receiving better care. It also made me feel humble. These guys were working Christmas Day, most with silly hats on, yet the cheery and compassionate way they went about their business was inspirational. I'll remember this Christmas with a lot of sadness, but I'll remember the love shown by those nurses to my dad with a huge amount of gratitude, and pride that a man without an enemy in the world yet knowing his time is nearly up still had the charisma to endear himself to the nurses to such an extent. I'm not sure I've ever felt prouder of him. This is one post I want to be copied and reproduced as I want as many people as possible to hear about today's events, and the next person I hear slagging off the NHS might just suddenly be in need of their services themselves. Thanks for reading and normal services will be restored as soon as possible. I just wanted to share that with you. My apologies for the lack of posts over the last few days but the world has turned upside down rather. Due to family illness I won't be around for a bit but rest assured I will be back. In the meantime to those of you celebrating Christmas I hope you have a wonderful time. To those of you not, and I know it's not just me, I hope you find the strength, peace and love to get you through these tough times. To everyone I wish you a happy and successful New Year. Obviously with the silly season approaching there is little happening on the rural service front so anything that maybe interesting or relevant is going to get an airing. First of all many thanks to railcam.uk for permission to use one of their stills for this year's Christmas header pic. As you can see from the pic it was taken this morning at Ribblehead in North Yorkshire. Northern Rail Class 158 is battling manfully against the snow and it seemed an ideal and up to date pic to use. Railcam isn't just good for watching trains, but I've watched lightning storms and seen countless wildlife through their cameras. Worth a visit and supporting. Keeping with the festive spirit and two BorderBus drivers, Malcolm and Terry have swapped their buses for decorated grottos. I hope to do a special post on them nearer Christmas but the front of Malcolm's bus - the E300 - is just brilliant with a display of Santas, including a piano playing one in the centre. Here is a sneak preview of what is to come. There is a new arrival at BorderBus. It's not ready for the road yet as it is being upgraded to the high standard of comfort and reliability BorderBus expect to give their ever increasing customers. But I can confirm the registration! That's all there is for now! A few weeks ago I was in Aberdeen goggly-eyed at the wide vriety of vehicles up there. Well now there are more. First Aberdeen have received at least 9 ADL tri-axle E500's from First Glasgow. 7 have been branded for the university routes 1 and 2 and 2 remain unbranded. It is believed the delivery of the E500's may release some bendibuses...... My thanks to Donald Macrae for allowing me to use the pics, with credit to Stephen Pirie who took the pics originally. The weather has not been kind to buses this week. I saw these pictures on Flickr and thought they were worth sharing. The first one is from the Isle of Man and I have no idea what happened but this decker does not look very well! Not exactly sure what happened there but ouch. 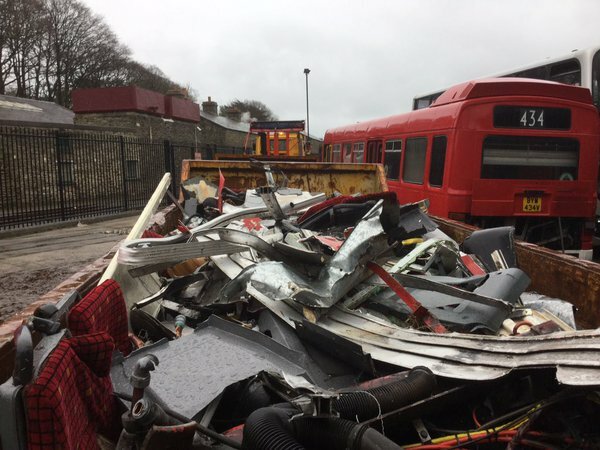 Rumours that in an effort to improve their decker fleet Anglian Bus had enquired about the vehicle appear to be unfounded as the bus has already been cut up and returned to its base in three skips as pictured on Twitter by @iombusandrail. Love the LN in the background though. 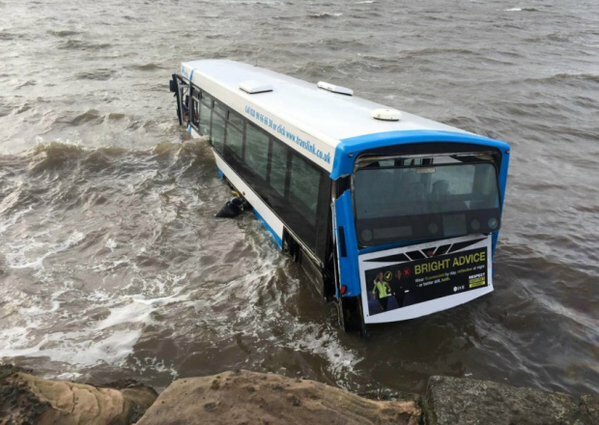 The second incident happened in Northern Ireland, when a bus crashed through sea defences and splashed down rather spectcularly. It happened on the ironically named Portaferry Rd. 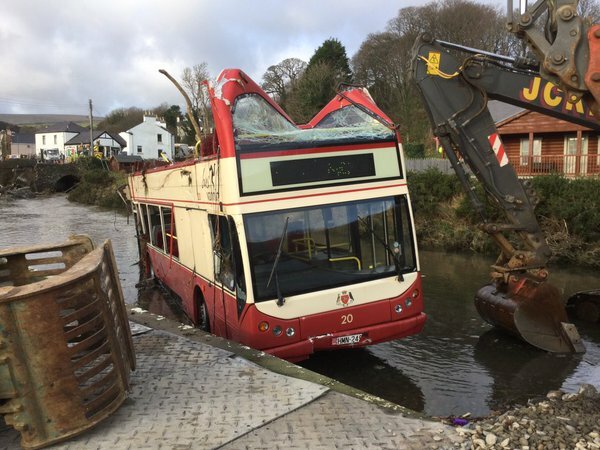 Note to the thankfully not seriously hurt driver - buses can do ferry duties but are not actual ferries - portable or otherwise! For the full story click here. And finally in the neverending battle against seat vandalism a local company thinks it might have come up with the final solution.... Still not as hard as Anglian Scanias! When First Essex decided to close Braintree depot earlier this year Stephensons stepped in and started operating some of the routes discarded by First. 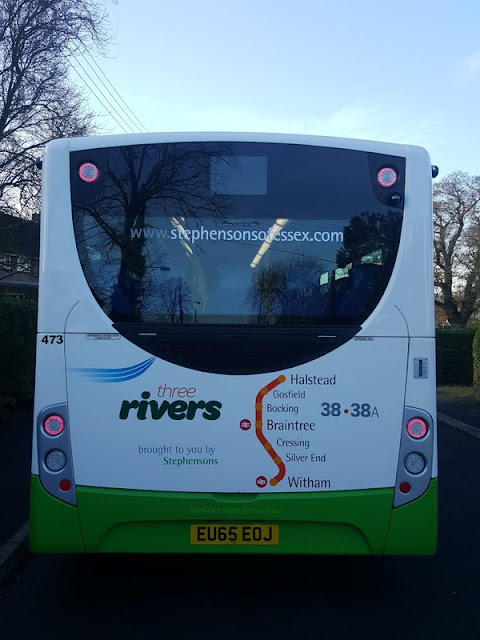 One of them is the route now branded "Three Rivers", the 38/38A which operates between Witham and Halstead via Braintree. 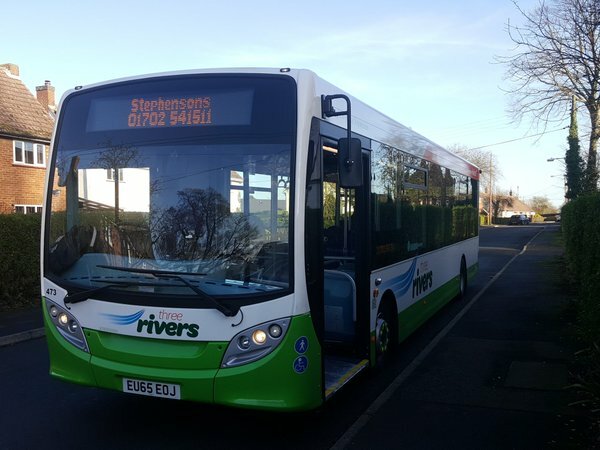 Yesterday Stephensons took delivery of 5 brand new ADL E200's for the route, and I am grateful to James, who via the North West Bus Blog made these pictures available. I would think. these are some of the last E200's built that are not MMC's (unless both versions are still available). For reference the buses are fleet numbers 471 - 475 and registered EU65 EOG/H/J/K/L. As a postscript it is noticeable that since First turned Braintree into an outstation the fleet based there has improved immensely. Presidents are replaced by ALX400 B7tl's, including ex Lowestoft 32651/2/4, and old Darts by B7rle's. 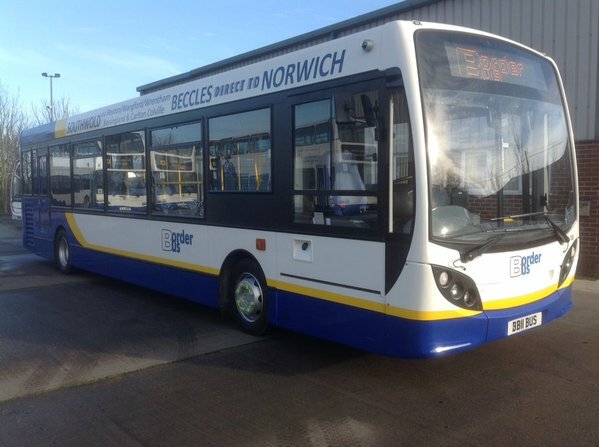 Also of interest is the apparent transfer of ex Ipswich P&R B7rle 69421 AU58 FFLfrom Colchester to Chelmsford. I had to go to the bank today, much to my annoyance. However the silver lining framing that cloud was it gave me an excuse to go to Lowestoft on the first day of the revised X1/X2/X22 services. Not something I would normally bother with these days but as I was there it seemed rude not to. 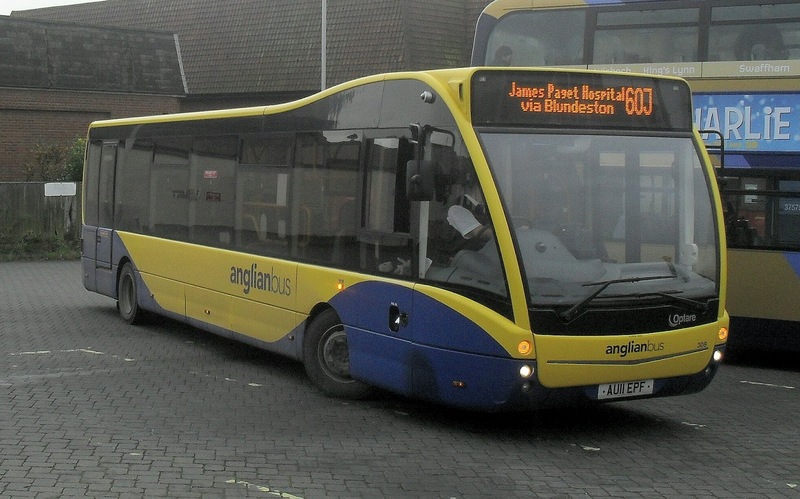 Nothing to report on the X1, as actually there are less X1's at Lowestoft now than there were, with two journeys an hour from Norwich now terminating at James Paget Hospital. However the X2 is now rather more interesting. Generally speaking thee are 4 buses an hour from Lowestoft to Norwich - two X2's which operate the usual route within Lowestoft but now go fast to Norwich via Beccles omitting North Cove, Hales, Loddon and Chedgrave. 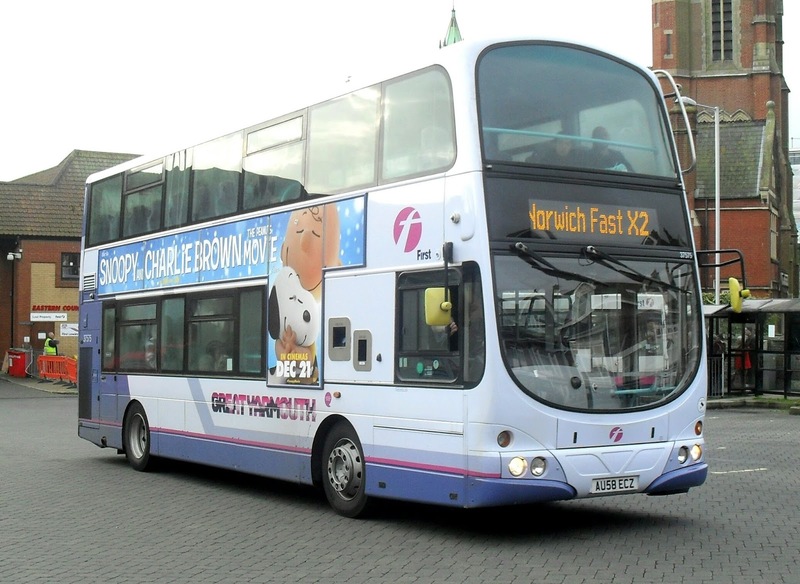 By lucky chance the first vehicle I saw on the new fast X2 was Gemini 37575, which only transferred over from Yarmouth yesterday, and still carries Yarmouth vinyls. Incidentally sister 37577, also transferred from Yarmouth, has had its vinyls removed so naturally was on the X1 via Yarmouth! 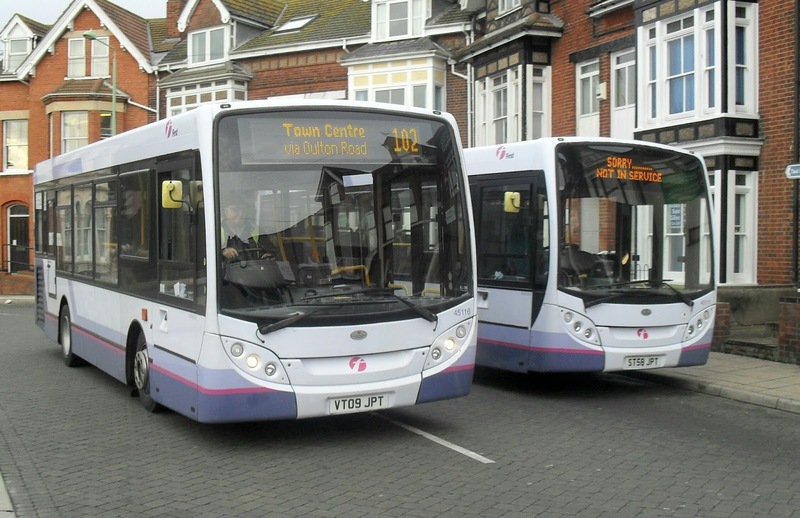 The other two buses an hour are on the new X22, which meanders around Lowestoft and Carlton Colville before following the old X2 route, one bus an hour serving North Cove and the other serving Hales. 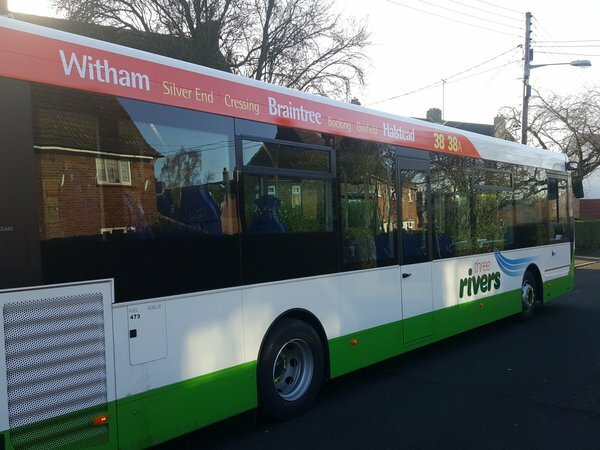 Both buses serve Loddon and Chedgrave. Here is 37571 leaving Lowestoft. There have been several fleet movements at Lowestoft recently, and I got the chance today to catch up on a few things. Firstly the last remaining Pointer Dart, 43466 has been finally withdrawn. 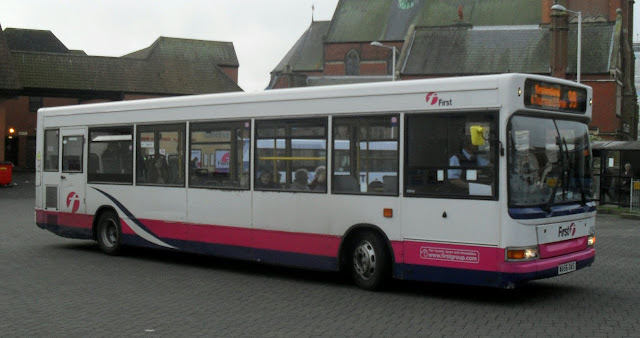 It has been replacd by a more modern Plaxton Dart from Bristol, 42943, WA56 OAS, the first of many that will be replacing the Jersey Darts. Today it was out on the 99's to Kessingland. I couldn't help noticig the seats didn't look that great. Hope they're not all like that. 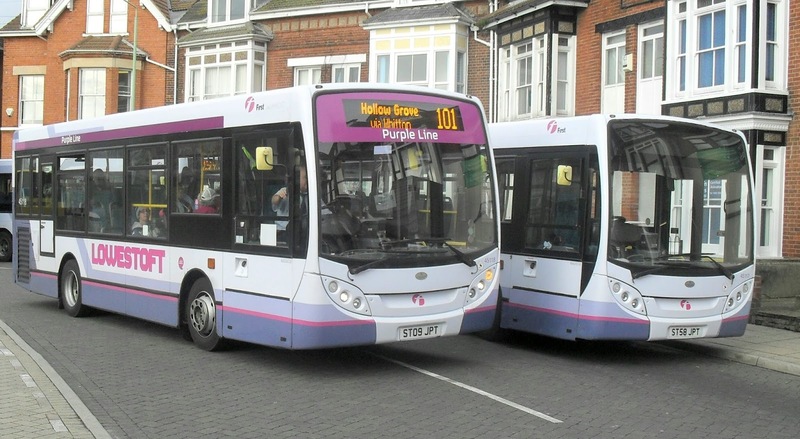 Three buses have returned to Lowestoft after a short spell at Norwich. E200's 45116/7/8 were all out on local routes today. 45117 had an extended layover which gave me the chance to get two rather good pics. I was also lucky enough to see oe of the two ex Essex B10BLE's seeing out their last days at Yarmouth. 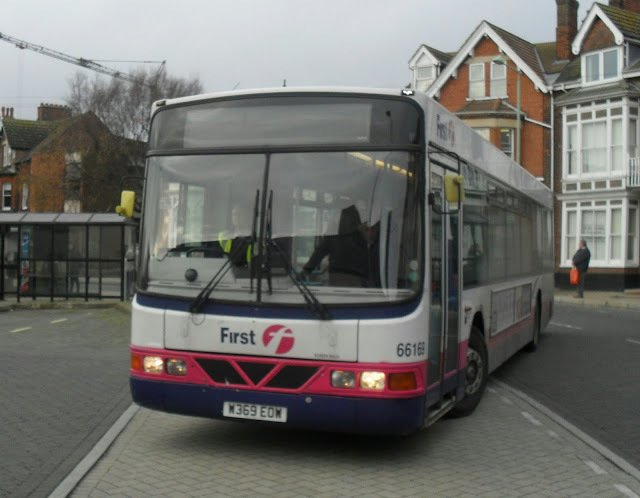 East Norfolk Bus Blog reports today that 66168 iis in fact going to get a reprieve and be converted at Rotherham to DDA compliant to join the loan fleet. Sadly, though, it seems that 66169, pictured below isn't so lucky and so the scrapman beckons in 24 days time. 66169 was on the 1A today. Switching operators for a second a new route in Lowestoft is the 60J, which operates 3 journeys to James Paget Hospital via Lound and Blundeston, replacing the recently withdrawn 60. Today Anglian Optare Versa 308 was on the route and I believe this to be the first published pic of a 60J. And finally I had to travel home via Beccles and couldn't resist this last pic. It seems the X2/X22 goes out one way and back the other. 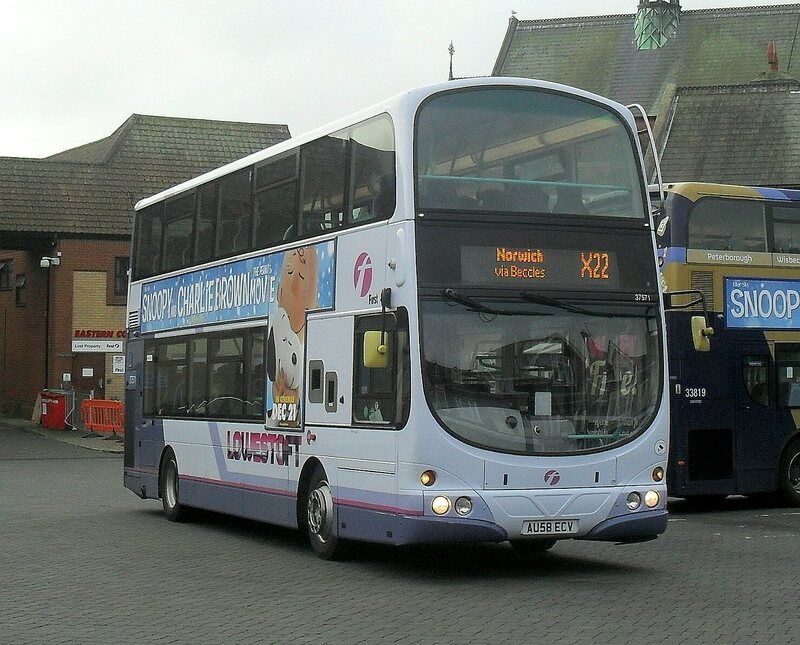 I had passed Lowestoft heritage bus 8 on the X22, but an hour later it was at Beccles bus station on the X2. Does look rather good. 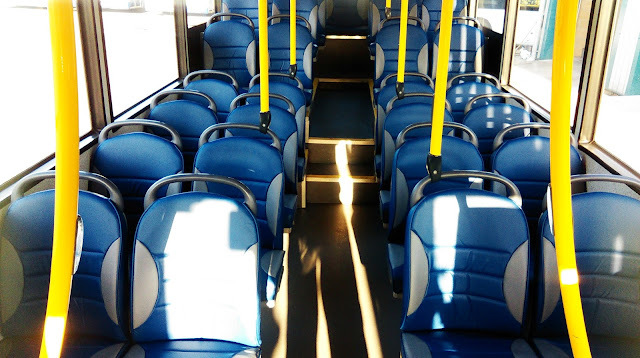 When was the last time you had to stand on a bus because it was full? No London doesn't count! Ok when was the last time you had to stand on a bus for half hour because it was full? How many complaints did you hear? Loads? Yup me too. Until yesterday that is. I caught the 0927 BorderBus service 146 from Wangford to Norwich. The last time I was on that service the E300 was filled so I was a little surprised to see baby E200 105 BB07 BUS on the run yesterday. Turned out the E300 was in for service prior to some interior work taking place this weekend of which more in a future post. However much as I like 105, and I really do like that little bus which for an 8yo E200 is a heck of an achievement, it was never going to be big enough. And so it proved as, despite not picking anyone up at Pontins, with a standing load going into Beccles, not many getting off and more replacing them we had 11 standing by time we got to Norwich. Dear Lord the grumbling and complaining there was. Oh hang on that's wrong - there simply wasn't any grumbling or complaining. In fact the opposite. On arrival at Norwich there were smiles, laughing, handshakes for the Malcolm the driver, and numerous timetables being taken. I've never seen anything quite like it. Although I'm paying BorderBus a visit tomorrow anyway I stayed with Malcolm for the trip back to Beccles as he was popping into the depot. I thanked Andrew Pursey for giving us the opportunity to play sardines on the bus that morning and, failing miserably to not look too chuffed with himself, he told me that the first three journeys into Norwich yesterday all had standing loads - and we were the only short E200 of the three. He then revealed that the loading figures for November had been rather good. In fact extremely good. They beat July's figures by 31% which is impressive by anyone's standards. Even more impressive for me though was that August's figures were also beaten by 25%. Why is 25% more impressive than 31% I hear you ask? Well quite simply in August there were more services as the non schoolday timetable has more 146 journeys. Plus, of course Pontins and the other holiday sites are in full swing. Yesterday concessionary pass holders were choosing to stand on the 146 rather than wait for an X2. While I was there yesterday a strange package arrived. It was some coloured flourescent tubes which BorderBus are trialing, hoping to reduce the reflection from interior lights in the windscreen of a couple of their vehicles. I happened to be back in Beccles late yesterday afternoon when BB12 came in and I saw these lights in action. Erm not quite sure what to make of it. The driver was well impressed with the improvement in his vision, but it did make the front of the bus look like a front window in a certain part of Amsterdam. Maybe the experiment needs to continue! The experimental lighting on BB12 BUS. It's pink! 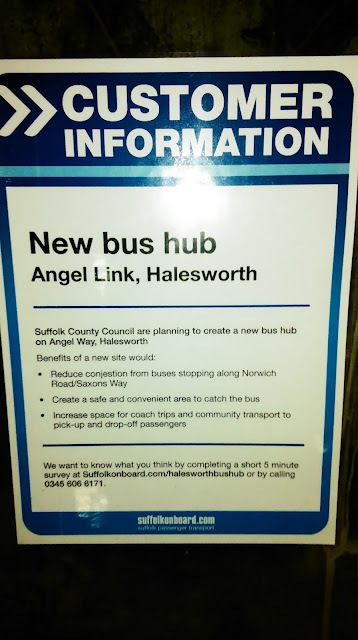 While waiting for my minibus connection at Halesworth last night something in the bus stop caught my eye. Suffolk County Council are proposing a new transport hub in Halesworth town centre and are asking for opinions, as you can see below. My opinions are as follows: Yes it is needed, a shame it's not a bit closer to the station but that can't be helped. However, it will only be a real success if bus services are integrated to connect with each other at the hub. No point having one if there are going to be long waits for connections. 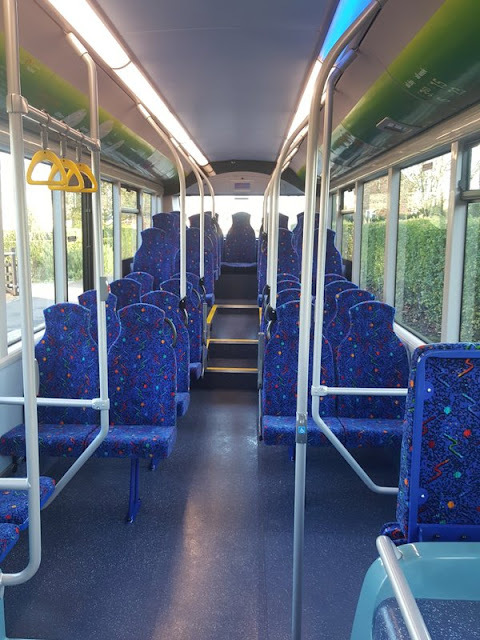 This is a perfect opportunity for SCC and the operators to organise service services so as many members of the public as possible can benefit from it and thereby increase demand for bus services. What a novel thought! Out of all the new buses I've been on this year the most impressive was the E400MMC I'm grateful yet again to Tim Miller for pointing me in the direction of this video produced by Alexander Dennis showing how the MMC was developed in conjunction with all the major operators. It's a really interesting video and worth a watch. I'll make my observations below. One of the things that made me smile was when a "rattle free bus" was described as the Holy Grail. Erm try an Olympian or Routemaster and I think you'll find the Grail was found many, many years ago. However it was good to see eliminating rattles was important to them and shows I wasn't the only whinging git regarding them! Also funny to see the guy from Lothian Buses saying how good they were and no reason why they shoudn't buy them. Lothian then went straight down the Wrightbus road! 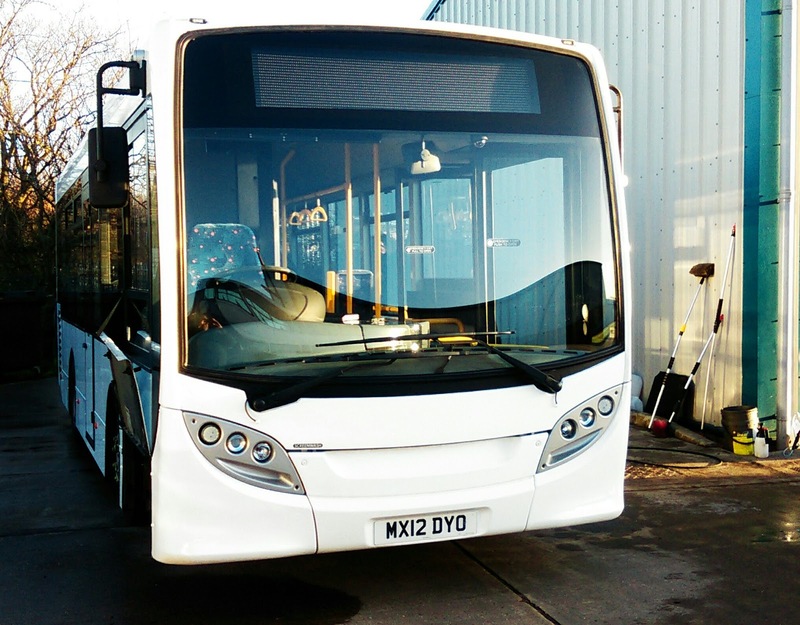 Alexander Dennis stated they have made over 200 changes to the E400 by listening to customers. That's really good, and the new E400 is a huge improvement, but my word it's a massive indictment on the old model. Those who have constantly criticised it, myself included can feel rather vindicated. Perhaps in a small way we can all feel responsible for this vastly improved bus. I thought about splitting this into two parts but since the next few days might be a bit in the air I'll do it all in one, so happy reading. On the final day of my long weekend in Scotland I had booked train tickets to Aberdeen. Two and a half hours each way, a round trip of over 250 miles for £22 return. Thanks Scotrail. So I settled down in my Class 170 and enjoyed a glorious journey up Scotland's East Coast in unbroken sunshine. This was the view of Dundee and the Firth of Tay. It was raining in East Anglia when I took this! I know we have some 170's in our area but since they stopped running through to London they don't really get a chance to spread their wings and really motor. The Scottish ones do and I have to say they are an extremely pleasant train to ride on for long periods. It didn't seem like two and a half hours before we were in Aberdeen. Also observed were E400's E200's and hybrid E300's. However Stagecoach also have a number of longer distance routes under a couple of brands. Megabus obvously and Buchan Express. If you look at the hydrogen bus I travelled on you will notice it was on route X17 to Elrick. Not sure what the X stands for as I didn't note much express to it but apart from the hydrogen bus I noted E400's and E200's also on the route. And this. Sorry the picture is blurred so I can't give a positive ID on the vehicle except it's a 12 plate, but I think I can be forgiven in not expecting to see this on a local bus route! 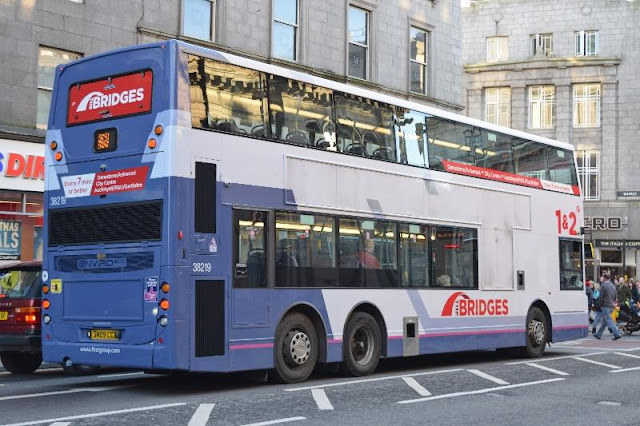 The Buchan Express coaches operate between Aberdeen and Peterhead/ Fraserburgh/Ellon and carry over 25,000 passengers a week. Stagecoach have recently invested in 17 Plaxton Elite-i coaches costing £323,529 each. The coaches, which are pay as you enter like normal buses boast leather reclining seats. free wifi, toilet, tinted windows, usb charging points, climate control and bike lockers. They also boast enormous presence. When I saw them last Monday and took this picture I was unaware ths was their very first day in service. I think that's what is called timing. Now to return and ride them! So on to First, and of course Aberdeen is the Headquarters of First, so you would expect a fleet of the finest vehicles in their home town. Actually that is not the case. The newest vehicles were the now ubiquitous Streetlights with some E200's thrown in for good measure. Some 57 reg Geminis were operating on a platinum service but there were a huge amount of old Wright Renown and Floline Scanias and Volvos. So many I'll be amazed if they are all replaced by the new year. Since none appeared to be repainted I'm fairly certain they haven't been convertd to DDA compliant. However what really caught my eye and totally unexpected were the bendibuses First have up there. This is 10168, a Wright Eclipse Fusion bodied Volvo B7LA. And so with enough time left a ride on one of these bendis was needed. Knowing my backside had a 24 hour journey back to Suffolk ahead of it I bravely waited for one of the leather seated examples to turn up and went for a trip. I was lucky to have an extremely friendly lady driver who had no problems with pictures and questions. She told me that First are due some tri-axle deckers imminently - I presume E500's and when I said I was from East Anglia raised an eyebrow as she had heard a whisper some of the bendis might be heading this way for a Uni route. That can only be the 25/26 but have heard nothing this end. What a superb few hours in the Granite City. I'm going to need a few days there next time but will wait for longer days to come back first. It's a shame Aberdeen is so far away as it's by far the most interesting and diverse city I've seen buswise for decades, and I include London in that. Loved it. To cap it all I bumped into an old friend there. I had read on Clive's blog that former Ipswich and Yarmouth Volvo B10LE 60813, originally sent to the South West for retirement had somehow found its way to Aberdeen (blow driving it all that way) and as luck would have it I saw her and managed to get one final pic of her before she suffers death by DDA at the end of the year. Oh and for those purists among you yes the Overground sign is still there!